A cast of world-class skaters will bring Disney Pixar’s magical characters to life in Vancouver this month with Disney on Ice: Rockin’ Ever After. This new show will feature moments from Brave, Tangled, The Little Mermaid, Beauty and the Beast, and more. Jam to a Scottish jig as a group of royal contenders from the Academy Award-winning Disney Pixar film Brave competes to win the heart of adventurous, sharp-shooting Merida, making her on-ice debut! Experience a show-stopping performance as Sebastian breaks out of his shell for one night only to make waves with Ariel. A chorus of harmless hooligans from Tangled unleashes musical mayhem when they get a visit from the sassy and spirited Rapunzel and her charming ally Flynn. And, get your feet moving as the Beast and his castle’s enchanted entourage take center stage in a spectacular show for Belle. 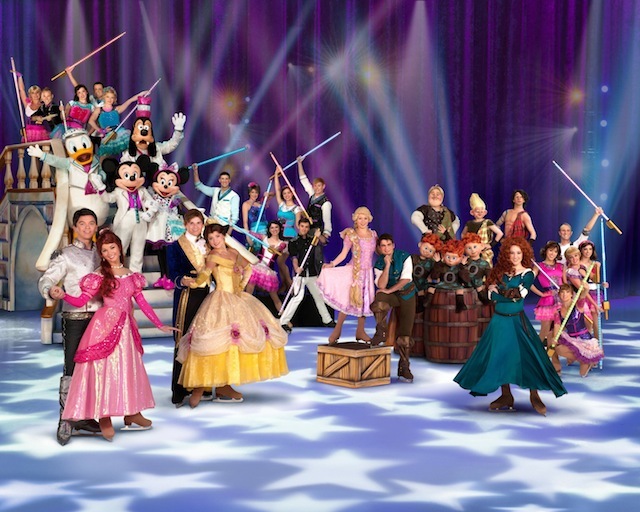 It will be a rockin’ remix of royalty when Disney On Ice brings this superstar line-up to Vancouver! Tickets are currently on sale from $24, $32, $55 (VIP) and $80 (Rinkside). Kids tickets available for only $15 each for select seating and performances (discount not valid for Saturday & Sunday 3:30pm shows). Special Opening Night discount tickets available for $14 each (not valid for premium level seating). Purchase tickets online, charge by phone at 604-757-0345 or in person at the venue box office. I will draw one winner at random from all entries at 12:00pm on Saturday, November 16, 2013. Update The winner is janet price! Ariel has always been my favourite. I would love to check out Disney on Ice! My favourite Disney character is Belle! Buzz Lightyear!My 8 and 9 year olds would love to attend.It has been a family tradition for the last few years but we didn’t buy tix this yaer so it would be great! Rupunzel! My girls would love to go!!! my daughter, joey, her hero is Merdia from Brave. She would just pee her pants to see this. Fav character is Donald Duck because he’s the only one who loses it! In our house it’s all about Rapunzel! Mickey’s smiling face made me feel very happy as I child so Mickey is the one and only, original Disney character for me. Hard to choose! Probably Rapunzel! Oh goodness so many to choose from! Have to stick with my childhood favourite Minnie Mouse! Belle!!! My favorite since childhood. Ariel, this would be fun to see! Cinderella will always be my favorite. So elegant. Carl Fredricksen from the movie, Up. That movie can sure bring the water works each time I watch it. hmmm.. tough choice but I will have to go with Wall-E! Ariel is my daughter’s favourite Disney princess!! Remy the rat from Ratatouille! I like Wall-E. The film was so meaningful! Our most favorite Disney Pixar character is Woody, because he’s so…. WAIT!!!!! There’s a SNAKE IN MAH BOOTS!!!! !… oh no hang on…, someone has poisoned the water hole. Never mind, it’s not an emergency…as long as my mommy juice is alright… phew. Lighting McQueen. Back in town from Scotland, it would make the trip. The darling old man from UP. Daughter’s current favorite is Ariel. My neice’s favourite is Princess Tiana, my youngest nephew is Race McQueen and mine is either Dory from Finding Nemo or Abu from Aladdin. Love that monkey! I love the Little Mermaid Ariel! Merida’s little brothers; Harris, Hamish and Hubert! My daughter loves Belle, who she calls Beauty and the Beast lol! Jessie from Toy Story!!! Hard to choose though!!!! My daughters’ favorites are Ariel and Cinderalla. Thank you for the contest! There are so many great Disney Pixar characters, but I think my favourite is Merida. Oh, and I also posted the tweet to Twitter (@JaylynneParsons). Thank you! Our favorite character is Ariel! My kids love Linguini and Remy from Ratatouille! Favorite disney character is buzz lightyear for my son! Merida/Ariel for my daughter!! My favourite character is Nemo. My two year old absolutely loves Merida!! the dinosaur from Toy Story, forget it’s name. wait googled it – Rex. My favourite character is Jasmine! Michael “Mike” Wazowski from Monsters Inc.